Water, Sewer and Garbage bills are mailed around the 1st of each month and due by the 15th. A late fee will be applied if payment is not received by the 15th. 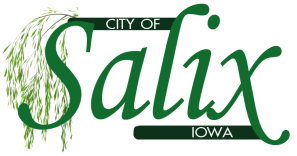 Water and Sewer are provided by the City of Salix. The city accepts cash or check payments. Customers may elect to have their bills paid automatically from your checking or savings account each month. ​Garbage Service is provided by CHN and billed together with the water and sewer bill each month. Garbage pickup is on Monday mornings, except when the Monday falls on a holiday, then it picked up the Tuesday following the holiday. Please remember to leave 4 foot of clearance around the can so that the automatic arms on the garbage truck can clasp the can. Drivers do not get out of the trucks to pick up garbage that is not in the can. ​Recycling is provided by Gill Hauling and is picked up every other Wednesday. There is also a large recycling container located in the parking area of the community center. New to Salix? An application and deposit of $150 is required prior to turning on services. Take advantage of automatic payment for your water, sewer and garage bill and have your monthly bill paid automatically from your checking or savings account each month. Save time and money: there are no checks to write, stamps to buy or late fees to pay. ​Electricity and Gas is provided by MidAmerican Energy. Call 888-427-5632 or visit https://www.midamericanenergy.com for more information. ​Postal Services are provided by the USPS. The Salix branch is located at 310 Tipton St. and open from 8am – 12pm Mon–Fri and 8am – 9am on Saturdays. Closed Sundays. Building permits are required and must be approved by city council. General maintenance such as replacing shingles, siding, paint, etc will not require a permit. A permit is needed for a patio or deck, fence, storage shed, (portable or permanent), in-ground swimming pool, driveway, basement, or to remove or demolish a structure. If you are unsure whether a permit is required, please call City Hall prior to work being started. When beginning any building project, please be aware of your property lines. To help locate your lot lines, a block pin is fixed in the corner of each block (west of Highway 75). City personnel are not responsible for locating your lot lines. at 1-800-292-8989 (or 811) to have your utilities marked. It's the Law!